On the night of December 16th, the Confederate rear guard under Lieutenant General Stephen D. Lee camped about seven miles north of Franklin. The soldiers were weary and poorly supplied as in their rush to retreat from Nashville, many had abandoned their equipment and muskets along the way. On the rainy morning of December 17th, the Confederates left around dawn. As they marched toward Franklin, Lee’s men had two encounters with Federal troops. The first took place around Hollow Tree Gap about five miles north of Franklin and consisted of a brief volley of fire at a portion of Union Major General James Wilson’s advanced cavalry. A more serious action occurred around 9:00 a.m. as two mounted Federal regiments attempted a frontal charge on the Confederate line. The Con- federate troops, however, were able to repulse the attack, which resulted in twenty-two Federal casualties and an additional sixty-three captured. As more Federal troops advanced, Lee’s rear guard withdrew around 10:00 a.m. to press on to the Harpeth River and into Franklin. Two bridges spanned the Harpeth River offering quick passage into Franklin – a temporary pontoon bridge and a railroad trestle bridge near Fort Granger. 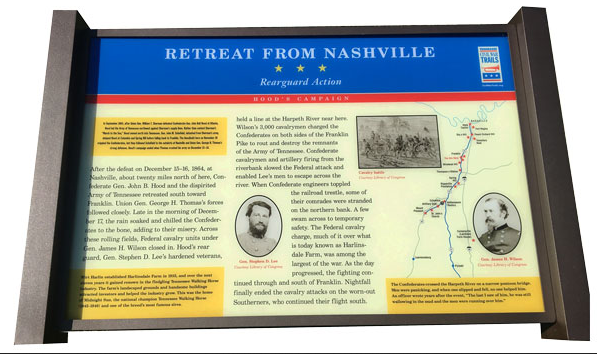 By 10:30 a.m., the last of the Confederate wagons were crossing the bridges over the Harpeth River and troops had begun to disassemble the pontoon bridge when Wilson’s cavalry attacked. Brigadier General Randall Gibson’s Brigade of 500 Louisiana infantrymen was positioned near the river and the railroad overpass at Liberty Pike. Assisting Gibson was a portion of Brigadier General Abraham Buford’s cavalry and two field guns. The Confederate soldiers were no match, however, for the nearly 3,000 Federal cavalry. Buford’s cavalry was driven “in confusion into the river,” which was quickly rising due to the rainy weather. Surrounded, Gibson’s men fought back and sustained forty casualties before escaping. Panic and confusion reigned as men fled across the pontoon bridge. A Confederate battery positioned along Front Street in Franklin began to fire upon Wilson’s cavalry causing them to temporarily draw back. Lee’s men rushed to destroy the pontoon and railroad bridges to prevent the Federal troops from crossing. Given this brief respite, Lee ordered the immediate evacuation of Franklin. No longer having the bridges available, Wilson’s men hastened to the nearest fords to beat the rising water. Meanwhile, additional Federal troops entered Franklin from the west. Around 1:00 p.m., the Confederate rear guard under the command of Lieutenant General Stephen D. Lee began to withdraw toward Winstead Hill south of Franklin. As some of Wilson’s cavalrymen fired volleys towards them, a shell tore into Lee’s boot breaking several bones in his foot. 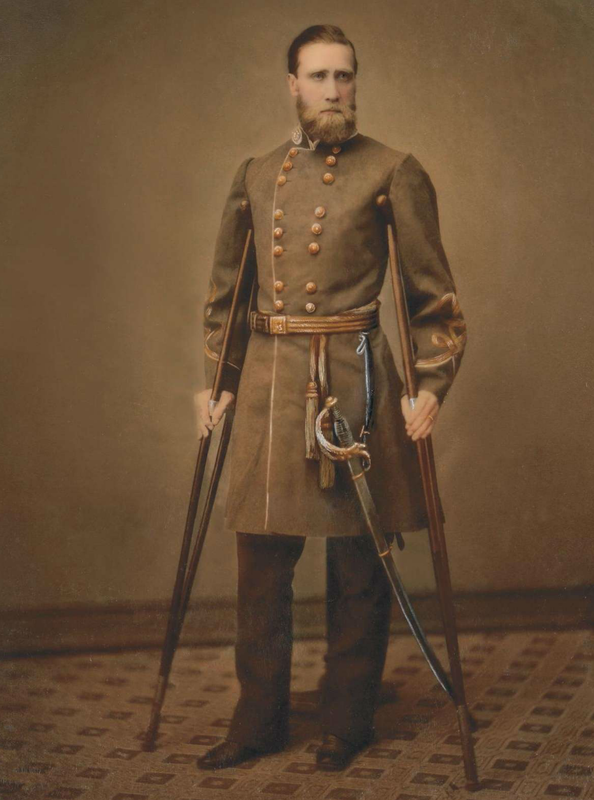 Despite his injury, Lee remained in command as the Confederates withdrew south down Columbia Pike. Wilson regrouped his forces and sent troops down Carter’s Creek, Lewisburg and Columbia Pikes in pursuit of the Confederates. Federal troops traveling down Columbia Pike quickly gained on the Rebels who maintained a line of battle as they headed toward Spring Hill. Around 4:00 p.m. the Confederate rear guard formed a line about one mile north of the West Harpeth River. Wilson ordered a frontal attack on the Confederate line and sent brigades to swing around the line’s flank. Around 200 cavalrymen swiftly advanced south down Columbia Pike toward the center of the Confederate line in a column of fours, sabers drawn. With the flanking brigades, the Federal line stretched nearly one and half miles long. Some 700 Confederate infantrymen were posted along the road under the command of Major General Carter L. Stevenson. As the Federals attacked the fighting was brief but fierce. “They swooped down on us with pistols, carbines, and sabers, hewing, whacking, and shooting,” one Confederate officer later recalled. Stevenson’s men repelled this charge and formed three ragged lines of a hollow square as they withdrew with their bayonets drawn. The Federal cavalrymen continued to strike against Stevenson’s troops as they made their way across the West Harpeth River. As the Confederates stopped to reorganize, Wilson’s men struck again. By this time darkness had fallen and both sides were confused. The Federal cavalry were nearly on top of the Rebel infantry when the firing began. The ensuing melee was brutal as most took the form of hand-to-hand combat with clubbed muskets and side arms. The darkness and the fact that many Confederates wore captured Federal overcoats added to the confusion. When additional units joined the Federals the Confederates were forced to retreat down Columbia Pike and abandoned three 12-pounder guns along the way. They soon encountered Major General Henry Clayton’s Brigade, who, after hearing the gunfire, had formed a line to assist their fellow Confederates. As Stevenson’s men joined them, the Rebels were attacked from the west by additional Federal cavalrymen. A quick round of fire from Clayton’s men soon repulsed the Federals, and the Confederates continued to withdraw. Exhausted, the Confederates withdrew to Thompson’s Station where they camped with the remainder of Lee’s troops. A series of skirmishes were fought from the West Harpeth River south to the Tennessee River, as Wilson’s cavalry and the remainder of Thomas’ army pursued Hood’s army. 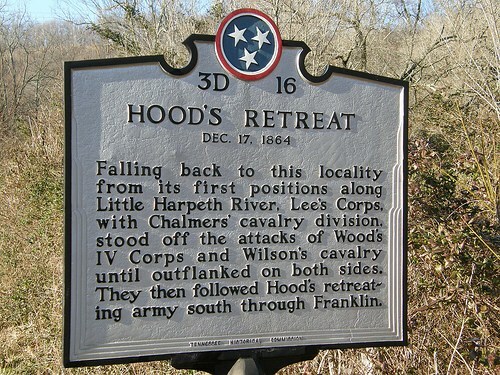 The retreat would finally end on January 1, 1865 when Hood’s army crossed the Tennessee River. What was left of the Army of Tennessee was eventually sent to the Carolinas to contest Sherman’s advance. occupied the area around Devil’s Den but were pushed out by the Confederate’s coming from the northwest. Hood’s division then made their way across Plum Run Creek and headed up towards Little Round Top. 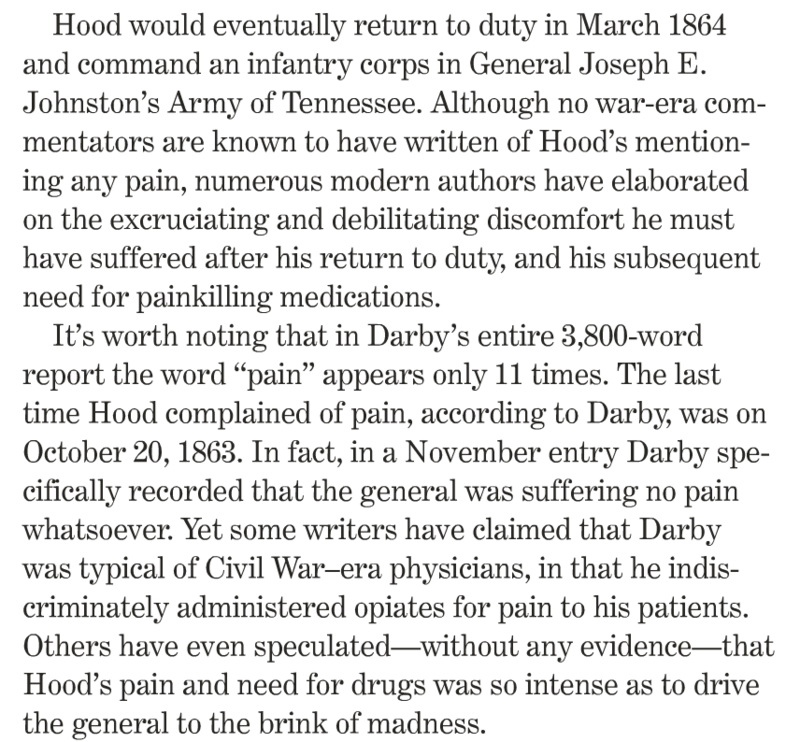 Hood was struck by shell fragments at Gettysburg, severely wounding his left arm. 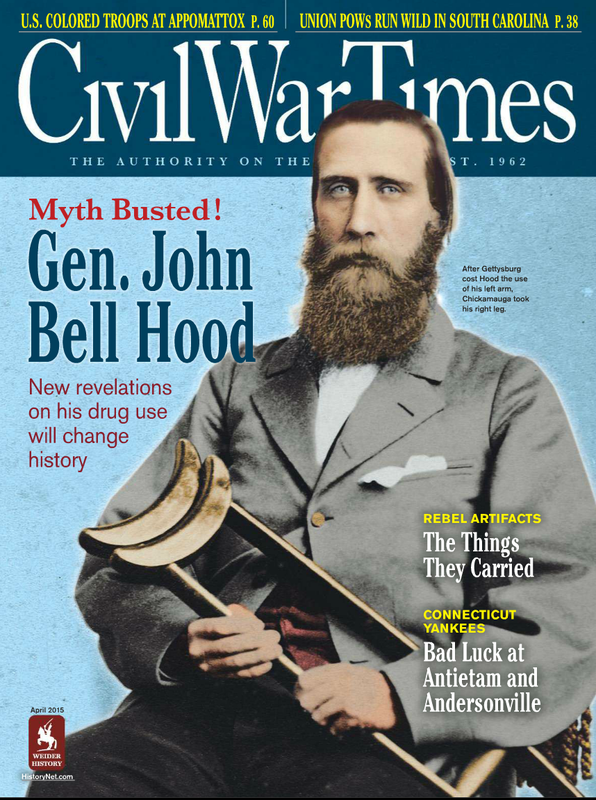 For all of those people, including published historians, who have always thought that John Bell Hood was doped out on laudanum at Spring Hill and Franklin, you better check your uneducated assumptions against the facts that are now indisputable. Stephen M. Hood sets the record straight. Here are some screen shots of the current issue of CWT (April 2015). The article starts at page 30. 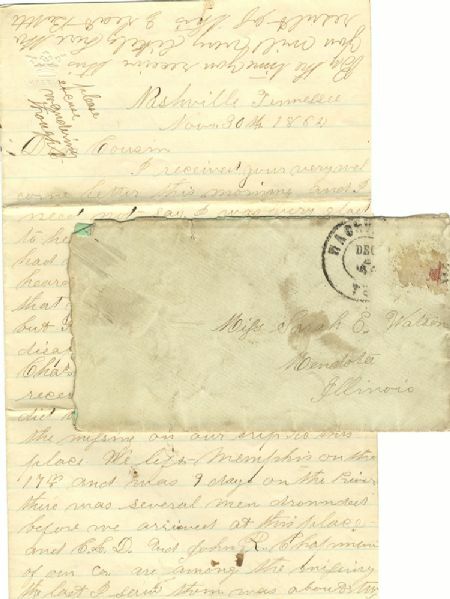 To be published in August 2014, Amazon says: Scholars hail the find as “the most important discovery in Civil War scholarship in the last half century.” The invaluable cache of Confederate General John Bell Hood’s personal papers includes wartime and postwar letters from comrades, subordinates, former enemies and friends, exhaustive medical reports relating to Hood’s two major wounds, and dozens of touching letters exchanged between Hood and his wife, Anna. 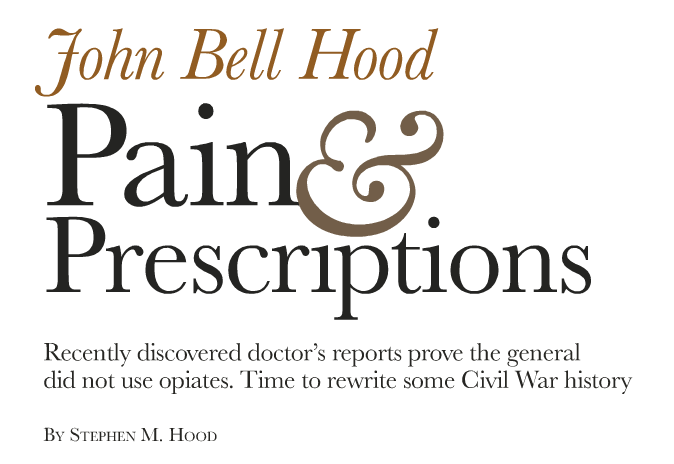 This treasure trove of information is being made available for the first time for both professional and amateur Civil War historians in Stephen “Sam” Hood’s The Lost Papers of Confederate General John Bell Hood.